Finally an easy way to export your ecwid, Shopify and Highwire sales orders. Using this has been so amazing! I was able to process 100 orders in about 5 minutes! it’s wonderful! Being able to import my online sales information into QuickBooks quickly and easily is a great relief! …Renee Brown Blank Canvas Industries. Export your invoices from ecwid and import them into Quickbooks in minutes. The Ecwid-Quickbooks Exporter is a simple desktop utility that exports Ecwid sales and generates Cash Sale or Invoice Transactions that can be easily imported into QuickBooks. Makes an amazing shopping cart even better! 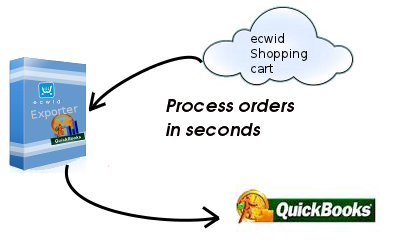 Quickly creates Quickbooks Import files from ecwid orders. Eliminate accounting errors by importing your data directly into Quickbooks. Automatically updates Quickbooks Inventory when importing sales.